Creation stories of the origin and beginning of the world have the spiritual function of situating us: giving us a sense of place and belonging in this world. 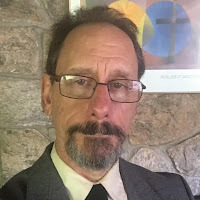 Creation stories -- such as Genesis 1 or the thousands of other creation stories among human cultures -- awaken our spirits, arouse us to awe and gratitude, show us that we are each more than merely our ego defenses. What’s your creation story, your origin myth? For most of us, our creation myth is the one we gather from science. "The epic of evolution," wrote biologist E.O. Wilson, "is probably the best myth we will ever have." Figures such as Lao-Tzu and Buddha and Jesus and St. Francis show us that you don’t have to have modern science’s stories in order to perceive the intrinsic beauty, goodness, and interconnection of things – at least, they didn’t. Buddha and Jesus didn’t need the scientific knowledge that every breath of air they took contained molecules present at the origin of the universe, that our planet and our bodies are composed of the dust of stars, that sea turtles and humans share a common ancestor, that 98.4 percent of our DNA is the same as a chimpanzee’s, or that about 50 percent of our DNA is the same as a banana’s. But if knowing that helps us awaken to awe -- and thus to beauty -- and thus to gratitude -- and thus to compassion -- then let’s squeeze those scientific findings for all the spiritual juice we can. Particularly for us Unitarian Universalists -- we embrace the project of using scientific findings within a spiritually satisfying story. So today I want to share some of the wonder, and the grace, and the mystery of our story. The crux of our story is: Complexity builds up from simplicity. Life is an emergent property: it emerges from billions of lifeless mechanical processes all going on together. Mind is an emergent property: it emerges from billions of mindless reactions all going on together. Species evolution is not a linear picture, a straight line of development. 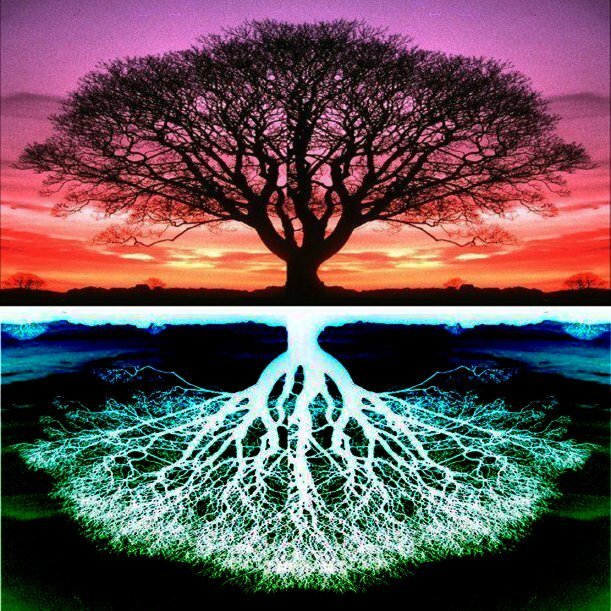 Instead, we see a tree of life, starting at a single point and branching off into the various species. There are billions of branches on that tree. The vast majority of them terminate before reaching the present. And there we are, we homo sapiens, at the tip-end of one twig. Once you see how the process works, then you see that process isn’t aimed at any of the billions of species it has produced. It’s just algorithms cranking away. 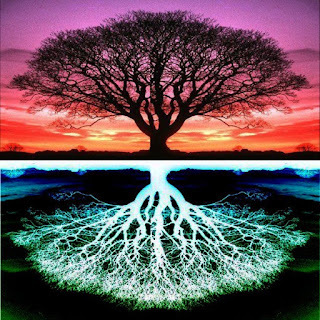 This nonlinear picture of a tree of life spreading, spreading, spreading, means that evolution has no direction toward any one particular species – or even any one particular genus or order or class. Rather, evolution is heading in billions of directions all at once. 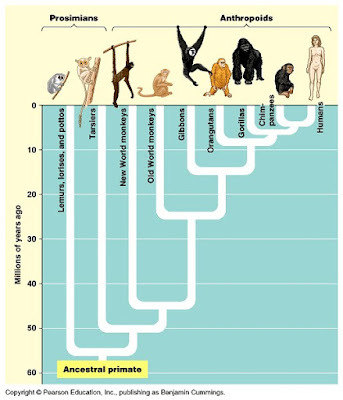 The common ancestor of humans and chimps lived about 7 million years; the common ancestor of humans, chimps, and gorillas, about 10 million years ago; and the common ancestor of humans, chimps, gorillas, and orangutans, about 14 million years ago. This means that we are more closely related to chimps than we are to gorillas – and it also means that chimps are more closely related to us than they are to gorillas – they are, in fact, exactly as far removed from gorillas as we are. If the tree is a good-sized oak tree, then our twig goes back only about an inch before reaching the point where the twig leading back out to the chimps branches off. 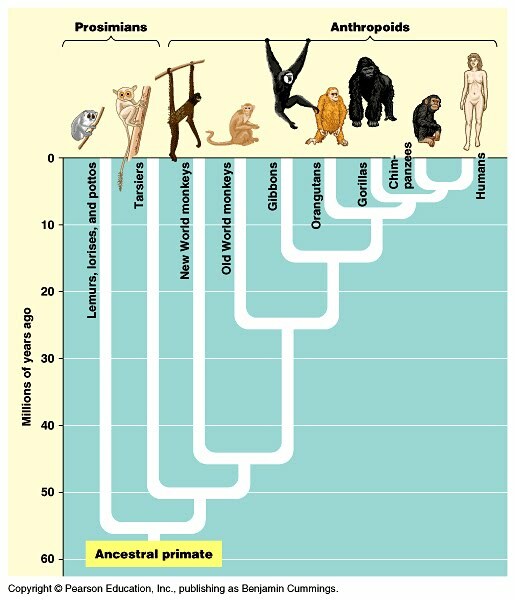 That’s our place in the grand scheme of things: on the chimpanzee twig. Our origin myth comes from science, yet is spiritually relevant, for it is a story of interconnection. It’s a story that shows us to be the product of grand, noble and creative forces beyond our control -- and also shows us to be the recipient of grace – that is, of gifts that we have done nothing to deserve. This tree of life did not emerge for the purpose of producing a twig of humans or human-like creatures. If you went back in time 2 billion years and started life on Earth from scratch all over again, the chances that you would ever get a primate, let alone a human, are vanishingly small. Humanity is a cosmic accident. It’s a mystery, a wonder, and a grace that we are here at all. The general tendency that some of the twigs on that tree will get more and more complex over the eons, however, is no accident. It’s true: Not all the branches head toward complexity. Some branches stay put. “Bacteria showed up billions of years ago, and there’s a lot of them still around, evincing no aspiration to climb higher on the tree of life” (Wright, Nonzero, 267). The most plentiful life form on the planet, both numerically and in sheer pounds, is just as simple now as it was two billion years ago. Meanwhile, other species have gotten less complex through evolution – because the costs of maintaining a complex feature became greater than the advantages. For example, species that have moved into environments of total darkness have gradually lost complexity in their eyes and optic nerves, sometimes without any increased complexity in other ways. Evolution doesn’t drive toward complexity unless it has to, and it often doesn’t have to. This is part 1 of 3 of "Spirituality of Evolution"